Download "Text: Buen Viaje: I Online version: Username: BUEVL105 Password: NepH4fre"
2 may fail only one opportunity and still pass the standard. If a student fails more than one opportunity, the student must make arrangements to do the assessment again in order to achieve a passing score. 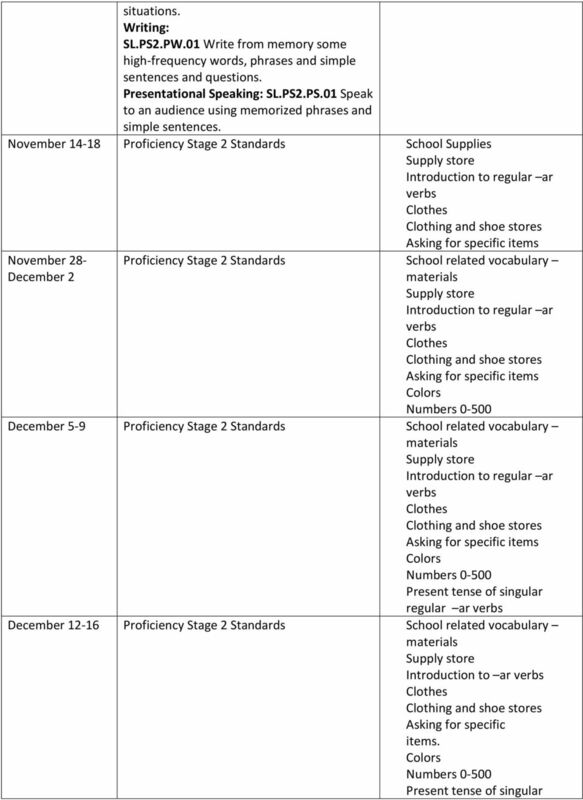 Students will have a folder with a standards monitoring sheet for each of the standards. Students will be able to compare assessments and progress among each set of assessments for each standard. I will also maintain a monitoring sheet. The scores for each standard assessment will be accessible in Pinnacle. 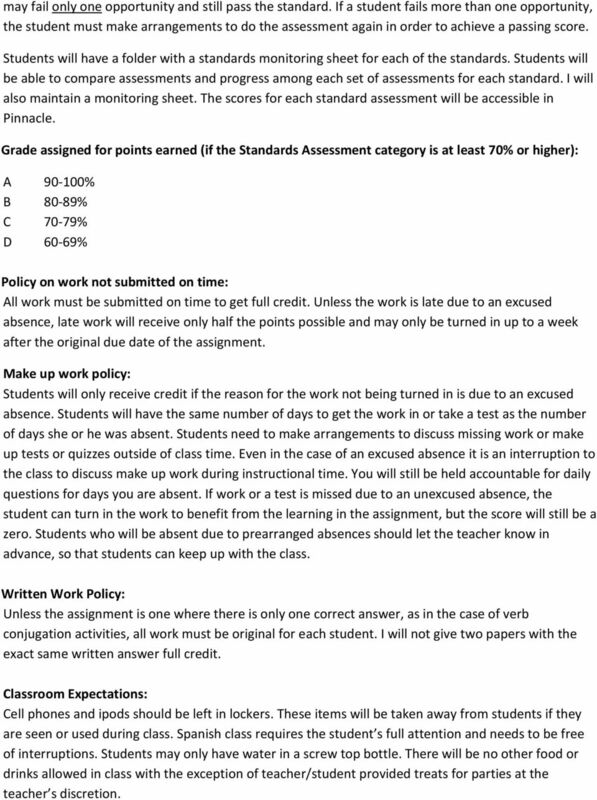 Grade assigned for points earned (if the Standards Assessment category is at least 70% or higher): A % B 80-89% C 70-79% D 60-69% Policy on work not submitted on time: All work must be submitted on time to get full credit. Unless the work is late due to an excused absence, late work will receive only half the points possible and may only be turned in up to a week after the original due date of the assignment. Make up work policy: Students will only receive credit if the reason for the work not being turned in is due to an excused absence. Students will have the same number of days to get the work in or take a test as the number of days she or he was absent. 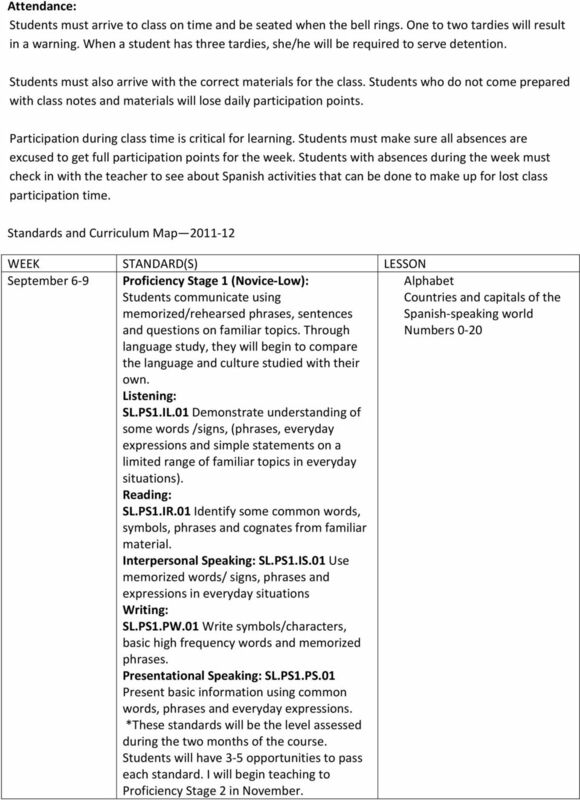 Students need to make arrangements to discuss missing work or make up tests or quizzes outside of class time. Even in the case of an excused absence it is an interruption to the class to discuss make up work during instructional time. You will still be held accountable for daily questions for days you are absent. If work or a test is missed due to an unexcused absence, the student can turn in the work to benefit from the learning in the assignment, but the score will still be a zero. Students who will be absent due to prearranged absences should let the teacher know in advance, so that students can keep up with the class. Written Work Policy: Unless the assignment is one where there is only one correct answer, as in the case of verb conjugation activities, all work must be original for each student. I will not give two papers with the exact same written answer full credit. Classroom Expectations: Cell phones and ipods should be left in lockers. These items will be taken away from students if they are seen or used during class. Spanish class requires the student s full attention and needs to be free of interruptions. Students may only have water in a screw top bottle. There will be no other food or drinks allowed in class with the exception of teacher/student provided treats for parties at the teacher s discretion. 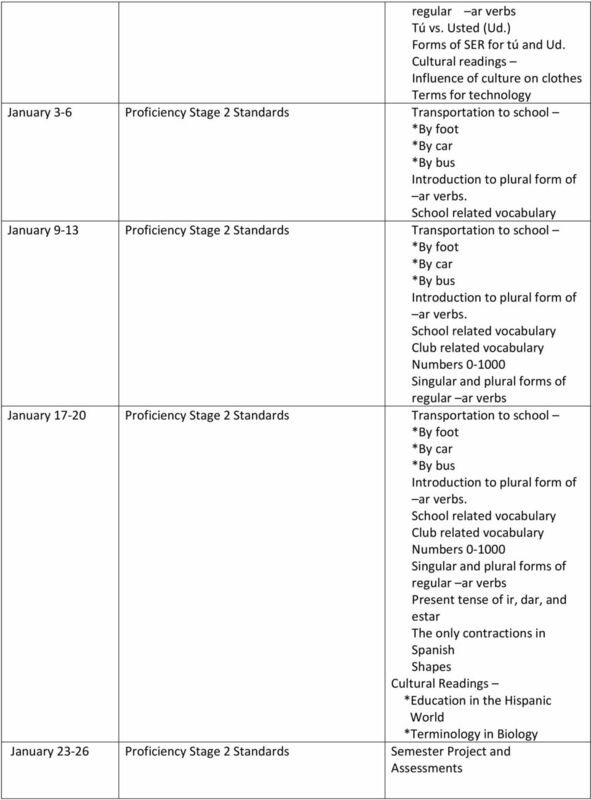 Spanish Curriculum Grades 4-8 Spanish Grade Four 1. Students will be introduced, recognize, and recite the Spanish Alphabet. 2. Students will recognize, recite and respond to simple Spanish greetings. Materials: Children s literature written in Spanish, videos, games, and pictures comprise the list of materials. Unit 1, September TB Preliminary Lesson Unit 2, October TB Unit 1 Lesson 1 How do Spanish-speaking people living in New York City celebrate their Where do teenagers go during their free time in Florida? 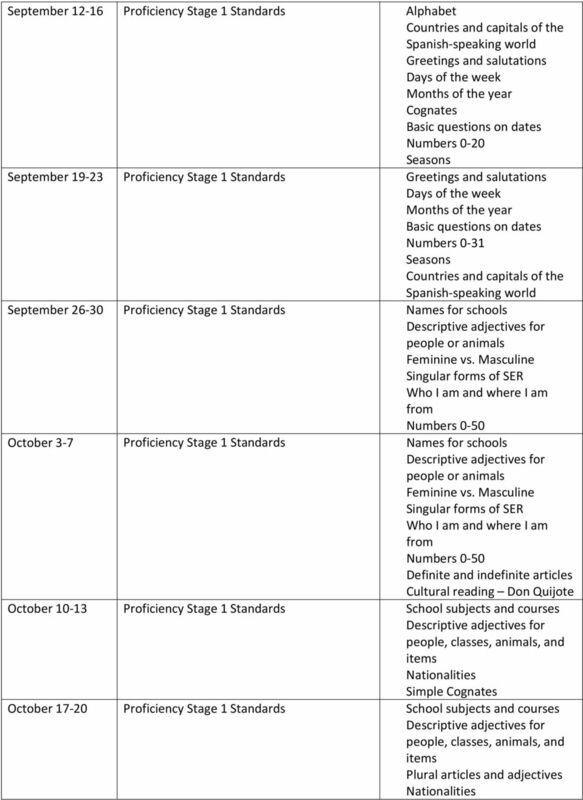 Bexley City School World Language Program Overview Communication express needs, feelings, and opinions. provide and obtain information. understand spoken and written language. function in authentic situations. Learner Profile- By the end of Level 1, students should be able to function at a Novice-Mid level on the ACTFL proficiency scale. 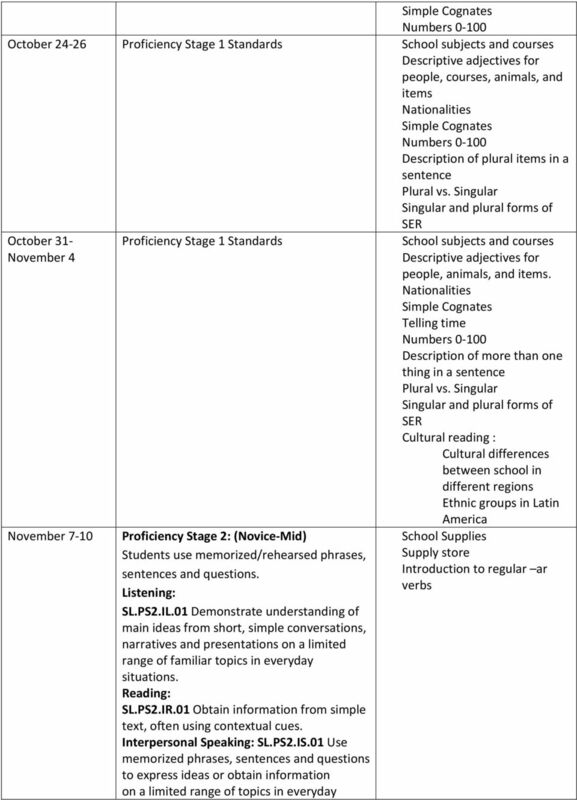 CANYONS SCHOOL DISTRICT WORLD LANGUAGES: SPANISH Beginning Language Level 1 Learner Profile- By the end of Level 1, students should be able to function at a Novice-Mid level on the ACTFL proficiency scale. WLG200: Spanish II Students continue their introduction to Spanish with fundamental building blocks in four key areas of foreign language study: listening comprehension, speaking, reading, and writing. 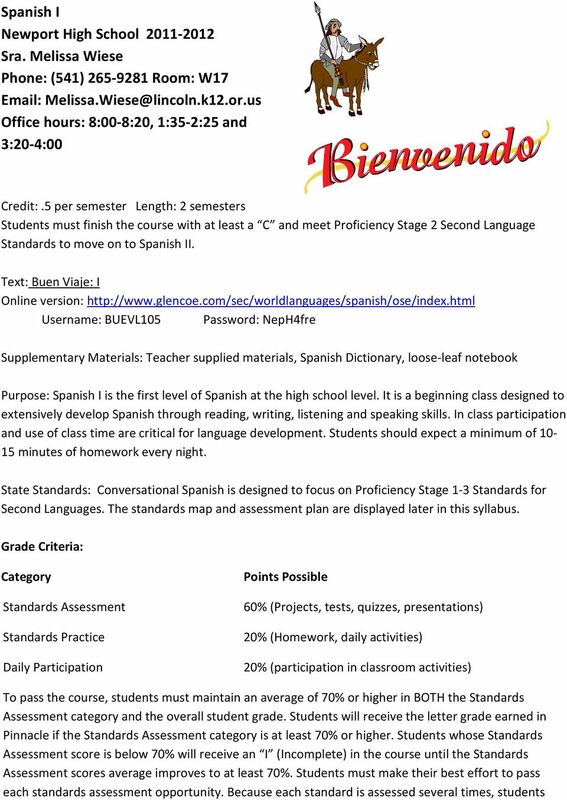 Pre-Requisites for Spanish 1010 Previous knowledge of Spanish is not required for taking Spanish 1010. Projects Students will be required to do PowerPoint(s) Presentations and oral presentations. Unit 1, September TB Preliminary Lesson Unit 2, October TB Unit 5 Lesson 1 What do you and your family like to eat? Unit 1, September TB Preliminary Lesson Unit 2, October TB Unit 5 Lesson 1 What do you and your family like to eat? Do you live in an apartment or a house? What do you do for fun when you are not in school?